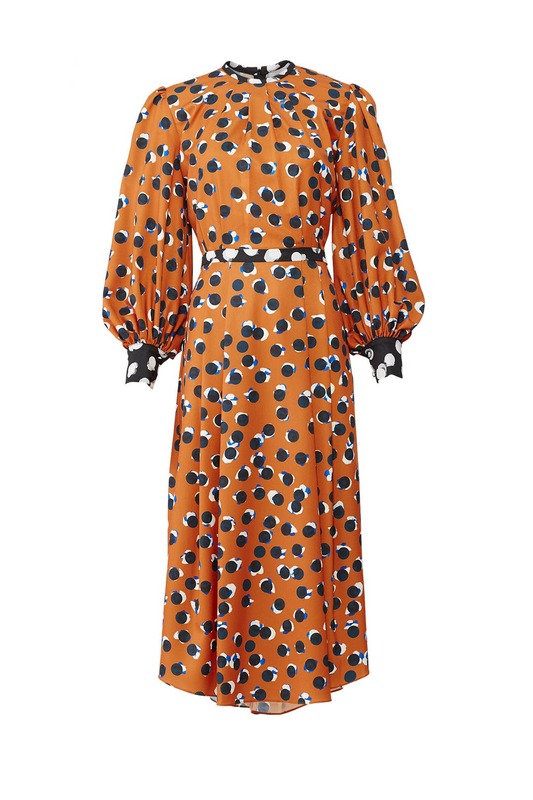 Abstract spots and voluminous sleeves lend artful appeal to this vintage-inspired Hunter Bell midi dress. Style the look with the Joanna Laura Constantine Monochrome Earrings. Sized: 0-12, one length available. Regular measures 52" from shoulder to hemline. 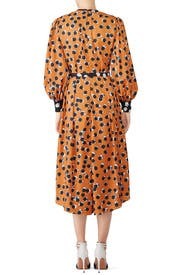 Burnt orange printed crepe (100% Polyester). Hourglass. Long sleeves. Crew neckline. Hidden back zipper with hook-and-eye closure. Partially lined. 52" from shoulder to hemline. Made in the USA. This runs big and I wish I had ordered the 0. There is a lot of material so it was a bit overwhelming on my petite frame. The print is amazing so I made it work. It was big in the waist and hit my ankles. Does the pattern have navy or black dots? With the flowing sleeves and long skirt, there is so much material. I had to pin the waist by about 4 inches so that I wasn't entirely lost in it. But I did get lots of compliments on it. I love this pumpkin color and it's really for the fall. I thought that this dress would be okay since I'm 5'9, but it looked very matronly. 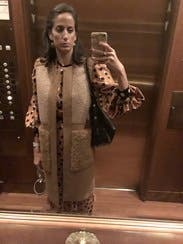 There is so much material in the sleeves, and the way it is cut through the shoulders, and it is very long, even with heels - I looked like I came off of Little House on the Prairie. Loved the print, really fun and loud but couldn't pull off that much material. 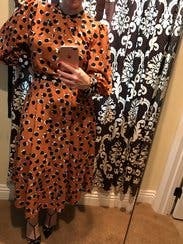 Amazing dress for a work meeting or event! So different! I wore it extremely hungover for a day of back to back meetings and I looked so put together no one knew I was dying inside. Loved this totally 80s dress! Perfect for a fall evening out! This dress has the most beautiful fabric, the print is stunning and it is well made. The proportions of the dress are strange. The sleeves are extremely large -- while they are meant to be voluminous these are EXTREME. Making it even stranger, the portion of the sleeve that's meant to be tighter at the wrist is also very large, which just makes the sleeves seem like they belong with a different dress. Otherwise, its a nice dress. Light material. Tight around wrists. Neckline sagged a tad bit. Big sleeves. Waist hemline was a bit low for my torso, but nothing a snug belt couldn't fix. 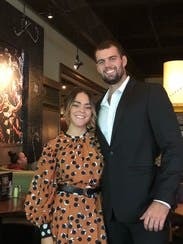 I'm 5'3" and the dress was about three inches from my ankles. I really loved the pattern, colors, and uniqueness. I would recommend as I had a ton of fun wearing this piece. Perfect for a fall festivity. You can't take this dress too seriously otherwise the amount of fabric can age you! 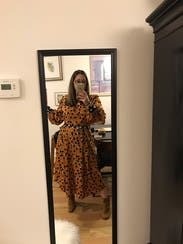 It fit fine (def runs large - order your smaller size), but like other shorter women, I also felt that there was a lot of fabric and it went mumsy and unflattering. The torso area is especially problematic with lots of pleating and massive sleeves with an already-busy print. 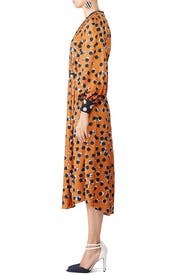 If this dress was sleeveless and pleatless on top it would be perfect because the print and fabric are fantastic. 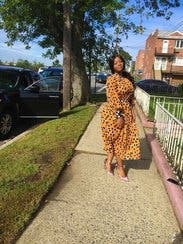 I wore this beautiful dress to church. It's light and weight and made my waist look good! Loved it! 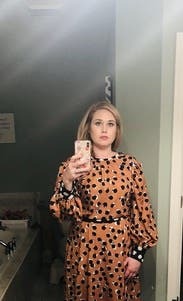 Great bell sleeves and pattern on this made it just funky enough for work and going out for drinks. Fits snug at the waist. Beautiful silk material. Love the pattern and sleeves!! 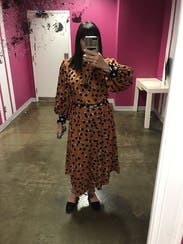 Is a bit long for my 5'3" frame and the waist could be a tad snugger, but I loved it! I loved wearing this on a date night recently. This dress has a fitted waist but is true to size and still worked with a larger chest! I styled with black tights and booties and leather moto! 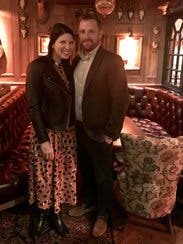 I loved this dress so much I also wore to work a few days later! The pattern is striking and very fun, but the cut screams professional. The waist was a bit big (not by much) so I belted it to create a great silhouette. the sleeves are blowy and fashion-forward, taking on that prairie look without the frill. 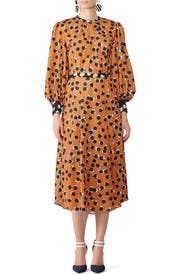 Gorgeous print and color but the fit was frumpy for 5'2. Even the sleeves were way too big. I kind of looked like i was wearing curtains. 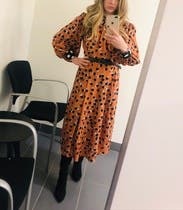 I wore this dress to a workshop I was teaching and then to a birthday brunch. The sleeves on this are to die for. I love a good sleeve! I ordered the 8R and it fit really well. I have a short torso and so the detailing on the waist ended up getting lost under the excess of fabric from the chest area that inevitably always becomes a thing for me. It didn't matter one bit and gave my waist great definition which is always a must for me. Im normally an 8/10 and I wore an 8 in this one. It was too big at the waist for me so it created a weird bubble in the back. I got lots of compliments though and it was very comfortable. Super comfy dress! Very loose fitting and a great eye catching pattern. I added a black belt to cinch waist a little. Great for everyday or a less formal occasion! The color is so cute and everyone loved the funky polka dot pattern. It is also flattering in pictures if you have an hourglass shape. Overall true to fit, a little loose on the waist but I am more pear shape. Enjoyed the roomy sleeves, but disliked how tight they became at the wrist. The length was perfect to wear with flats for work, and boots for a party. Good light, easy to the touch, and not see through material. 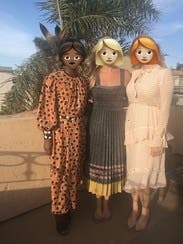 Beautiful fabric and completely unique pattern that goes from day to night perfectly! Decent fit- runs a bit small in the waist but nothing too crazy. I appreciated how modest it was, so I feel like I could wear it to any sort of occasion! Definitely keeping it for a couple more weeks in the hopes of getting to wear it again! This dress is fashion-forward, and very comfortable. 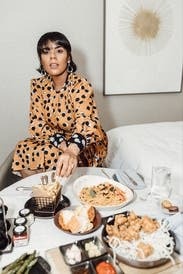 It did run big, and the style is sort of oversized, which made it a little challenging to style. However, I got lots of compliments on it and loved the pattern of the dress. Great dress that was very interesting and flattering! Really enjoyed wearing it. A bit long which is fine in the winter. Compliments galore. Wore with caramel high boots. Great look for work and true to size. 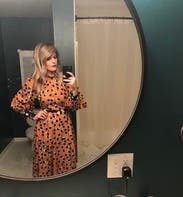 On other RTR reviewers, this dress had a great retro and timeless look. On me, it looked a little too 80's with the blousey long sleeves. Great quality, fabulous print, wonderful color! I was disappointed in this rental because I thought it would be fabulous for a party. I would say it looked like a mix of a clown and little house on the prairie. I think the downfall was how long the dress looked on my petite frame and how large the sleeves looked on an overall short person. I was told I look like Carrie Bradshaw ! Super comfortable dress. Great statement piece for work. Runs true to size. I'd recommend pairing with a black belt at the waist to give yourself more of a "put together" look. 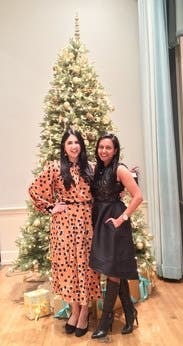 This was the perfect dress for a work event. Runs slightly large in waist. I wish I sized down but I have an hourglass figure. Go by the size of your waist to choose right size. I wanted to love this dress, but it's just too tent-like. The shoulders stick out like shoulder pads kinda. And the sleeves are billowy but have buttons at the wrists. There's just a lot going on with this dress. I still loved it, but the fit was a little odd. This dress was a fun way to end my work week. It fit really well, and I received a lot of compliments from my colleagues. Material is light, but the long sleeves and longer inseam made it totally appropriate for winter. I'd totally wear this again. 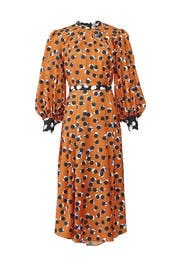 Easy to wear 1940's feeling dress with fun print mix. Got lots of compliments. Great, flattering fit. Runs slightly large to me. Could wear this one over and over!